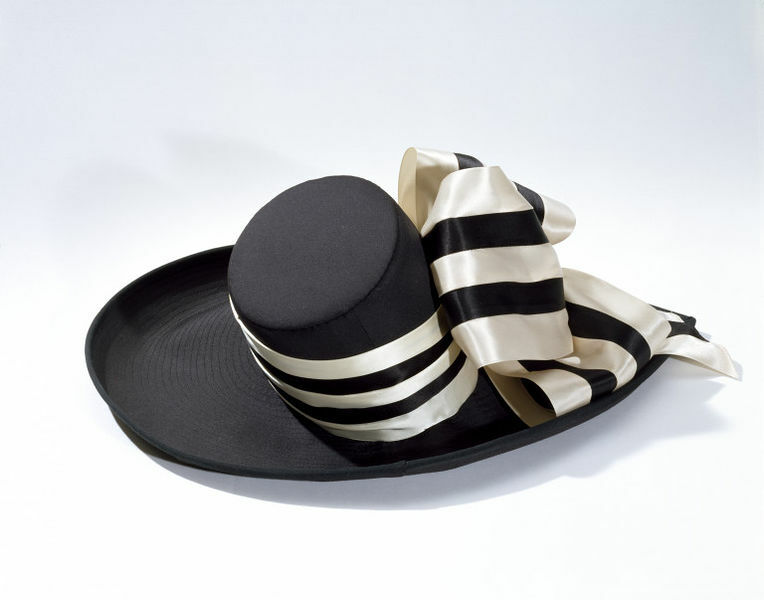 This black hat with large black and white ribbon bow recalls the hats designed by Cecil Beaton for the film 'My Fair Lady' featuring Audrey Hepburn. This film is well known within the millinery world for its 'Ascot' scene in which the dancers and players are adorned in voluminous hats with dramatic silhouettes. This hat was designed by one of London's most respected milliners John Boyd. Boyd learnt his trade as an apprentice to milliner Aage Thaarup before opening his own millinery shop in 1946 on Beauchamp Place, London. His clients include members of the Royal family and one of his most significant designs was the hat he created for the 'going away' outfit worn by Princess Diana on her honeymoon. The tricorn hat inspired thousands of copies and was a popular style worn throughout the 1980s. 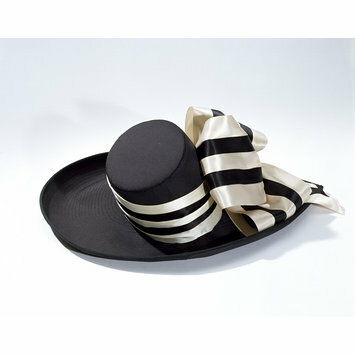 Woman's, black silk brim and crown trimmed with satin loops in cream and black, John Boyd, British, 1990s.